At what point can we concede that the realities of world politics require that moral principles be compromised, and how do we know when a real ethical limit has been reached? This volume gathers leading constructivist scholars to explore the issue of moral limit and possibility in global political dilemmas. The contributors examine pressing ethical challenges such as sanctions, humanitarian intervention, torture, the self-determination of indigenous peoples, immigration, and the debate about international criminal tribunals and amnesties in cases of atrocity. Their analyses entail theoretical and empirical claims about the conditions of possibility and limits of moral change in world politics, therefore providing insightful leverage on the ethical question of 'what ought we to do?' 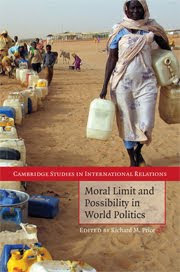 This is a valuable contribution to the growing field of normative theory in International Relations and will appeal to scholars and advanced students of international ethics and political theory.